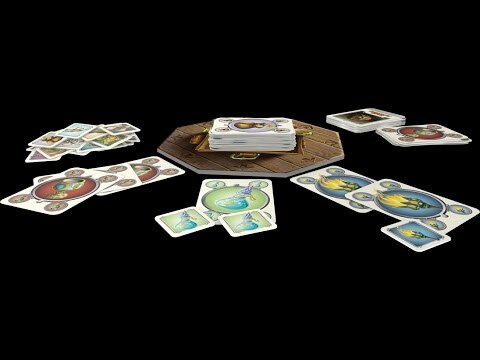 Dungeon Time is a real time, cooperative card game of exciting dungeon adventures and catastrophic failures for 1 (yes, you can play solo!) to 5 players. In Dungeon Time, you will enter a fantasy realm with only 5 minutes to complete your missions. As the sand falls in the sandtimer, you must race through the deck to achieve as many missions as you can. Simultaneously, you and your friends draw, play, draw, frantically looking for all the Items you need to complete your Missions. Get the Items in play as fast as you can, then complete a Mission by playing it on the Story deck at the right time, when your equipment is correct. You must try to beat the clock, going through the Missions as fast as you can; but you must also avoid being over–burdened by your equipment — miss the right Items and your Mission fails; bring too much unnecessary equipment in your Backpack and you lose the game. When time is out, go through the Story deck, to find out if you fail or if you win... and level up to higher challenges if you do!